Many of my patients ask me what is the difference between a Paleolithic diet and a Ketogenic diet? Essentially a Paleolithic diet was the diet of the Paleolithic man or “Caveman” for many, many, many millennium. The Ketogenic diet is designed to cause your body to produce ketones. Ketones are an alternative source of fuel that your brain can run on other than glucose. Both diets have their place and can have significant health benefits. I am going to go into some of the differences and why I might recommend one over the other. I recommend the Paleolithic diet primarily because I believe it is a more well-rounded diet and is much easier to stay on for the average person. It give you everything that you body needs without feeling you are depriving it too badly of things that it might want. This can result in some significant health benefits for almost everyone on the planet. The Ketogenic diet is stricter and has some other health benefits, especially for those who have problems handling carbohydrates, those with diabetes or pre-diabetes, or some of kind of pancreas problem. For those listed above, this is where I would recommend a ketogenic diet. I believe the big difference between the Ketogenic diet and the Paleolithic diet is carbohydrates. The Ketogenic diet is the Paleolithic other than leaving out some of the fruits and more starchy vegetables that will result in your blood sugar going up. If the blood sugar goes up at all, the body will not produce ketones and then you are no longer on the a ketogenic diet. One of the things that some of those who recommend the Ketogenic diet say is that you can eat dairy products. I do not usually recommend this because dairy products are one of the most highly allergic foods that people eat on a regular basis. 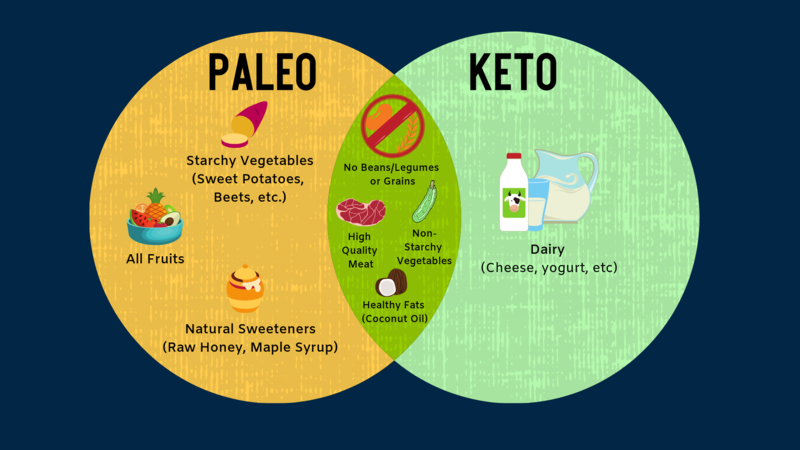 In comparing Ketogenic to Paleolithic, think of these two diets as having two intersecting circles. The part that intersects is the part that both can eat and in this intersecting parts are meats and vegetables that are not starchy. In the Paleolithic diet circle, what does not intersect with ketogenic diet is sweet potatoes and fruits. In the part of the circle in the ketogenic diet, that does not intersect with the Paleolithic diet, you will find dairy products. I hope this gives you a short primer on the difference and the benefits of both diets. I still recommend the Paleolithic primarily, but there are some significant benefits to the Ketogenic diet for some people. If you want more information on these diets or dieting and nutrition in general, please feel free to come in and consult with me. I would be happy to sit down and talk with you about your nutrition. Would you like a full nutritional evaluation? Click here to learn more.